Many users are not aware of support of Micro USB OTG on their smartphones. What is Micro USB OTG (On-The-Go)? USB OTG is a specification which allows smartphones to act as a host and allow other USB devices such as USB flash drives, digital cameras, keyboards, to attach and use them. Micro USB OTG forces two USB devices to get connected and work as master or host like we traditionally used with computer USB port. What is Micro USB OTG (On-The-Go)? USB OTG defines OTG A-device and OTG B-device as roles specifying which side will supply power to the link and which is the host. OTG A-device is the power supplier, USB host and OTG B-device is a power consumer, USB peripheral. The USB OTG and Embedded Host Supplement to the USB 2.0 specification introduced three new communication protocols, namely Attach Detection Protocol (ADP), Session Request Protocol (SRP) and Host Negotiation Protocol (HNP). How to Create DIY Micro USB OTG Cable? It is actually easy. In our previous one guide, we have shown how to cut normal USB cable. There you had 4 color coded wires. If you additionally cut a Micro USB male cable, then you can join with that previously cut USB cable’s female part. If you have female USB port as end, you can attach either a Micro USB or normal computer USB extension cable depending on your need. We actually did quite similar work for building DIY remote shutter for DSLR camera. Once you have the connector open with knife (not the wire), you’ll see the 5 little pins. Those pins and wires correspond to the chart above. 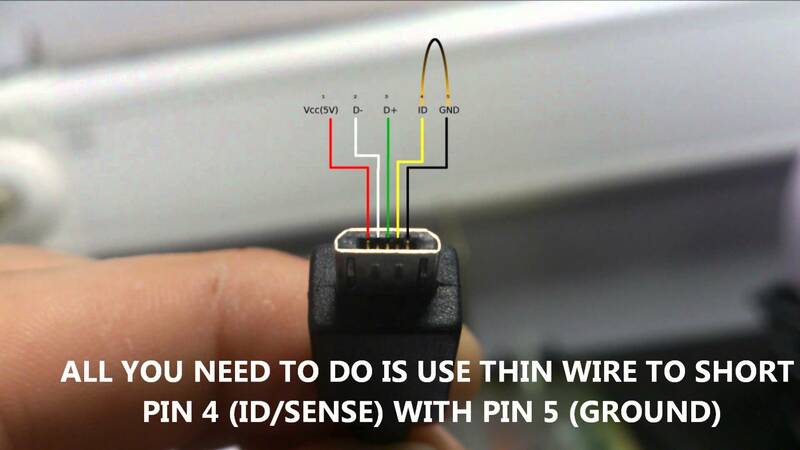 What you’ll need to do is short pin four (that’s the ID connection) to pin five (ground). Obviously you’ll need to use soldering for the work. Alternatively, for development works, you can solder male headers to the Micro USB end. That will make sense to “switch” mode on breadboard! This Article Has Been Shared 9678 Times! Here is How To Create Arduino MAX 7219 CNG Basic Circuit to Control LED, 7 Segment Displays in Own Custom Ways Rather Than Using Modules. Cite this article as: Abhishek Ghosh, "What is Micro USB OTG (On-The-Go)? Build DIY OTG Cable," in The Customize Windows, March 15, 2018, April 26, 2019, https://thecustomizewindows.com/2018/03/what-is-micro-usb-otg-on-the-go-build-diy-otg-cable/.